"What is better - a supercharger or a turbo?" But don't worry, we'll go into more depth than that here. Both superchargers and turbos have distinct advantages and disadvantages. Selecting the right kind of forced induction for your vehicle will depend upon your particular vehicle, your driving habits, your power preferences, and your needs. "a device (as a blower or compressor) for pressurizing the cabin of an airplane or for increasing the volume air charge of an internal combustion engine over that which would normally be drawn in through the pumping action of the pistons". "a centrifugal blower driven by exhaust gas turbines and used to supercharge an engine". According to Webster's, a turbocharger is included in the definition for superchargers - it is in fact a very specific type of supercharger - one that is driven by exhaust gasses. Other superchargers that do not fall into this category - the kind that we are all used to hearing about - are normally driven directly from the engine's crankshaft via a crank pulley. So in reality, it is not fair to compare all superchargers to turbochargers, because all turbochargers are also superchargers. For the purpose of this discussion, however, a supercharger will be considered all superchargers that are are not driven directly by the engine, while turbochargers will be considered all superchargers that are driven by engine exhaust gasses. Both superchargers and turbochargers are forced induction systems and thus have the same objective - to compress air and force more air molecules into the engine's combustion chambers than would normally be allowed at atmospheric pressure here on Earth (14.7 psi at sea level). The benefit of forcing more air molecules into the combustion chambers is that it allows your engine to burn more fuel per power stroke. With an internal combustion engine, burning more fuel means that you convert more fuel into energy and power. For this reason, supercharged and turbocharged engines normally produce 40% to 100% more power (depending on the amount of boost - check out our horespower calculator) than normally aspirated engines. A supercharger is mounted to the engine and is driven by a pulley that is inline with the crank (or accessory) belt. Air is drawn into the supercharger and compressed by either an impeller (centrifugal-style supercharger), twin rotating screws (screw-type supercharger), or counter-rotating rotors (roots-type supercharger). The air is then discharged into the engine's intake. Faster crank speed (more engine rpm) spins the supercharger faster and allows the supercharger to produce more boost (normally 6 to 9 psi for a street vehicle). Typical peak operating speeds for a supercharger are around 15,000 rpm (screw-type and roots style superchargers) and 40,000 rpm (centrifugal-style superchargers). A turbocharger operates in much the same way as a centrifugal (internal impeller) supercharger, except it is not driven by pulleys and belts attached to the engine's crank. A turbo is instead driven by exhaust gasses that have been expelled by the engine and are travelling through the exhaust manifold. The exhaust gas flows through one half of the turbocharger's turbine, which drives the impeller that compresses the air. Typical operating speeds of a turbocharger are between 75,000 and 150,000 rpm. Now it's time to evaluate the turbocharger versus the supercharger according to several important factors. The cost of supercharger and a turbocharger systems for the same engine are approximately the same, so cost is generally not a factor. This is perhaps the biggest advantage that the supercharger enjoys over the tubo. Because a turbocharger is driven by exhaust gasses, the turbocharger's turbine must first spool up before it even begins to turn the compressor's impeller. This results in lag time which is the time needed for the turbine to reach its full throttle from an intermediate rotational speed state. During this lag time, the turbocharger is creating little to no boost, which means little to no power gains during this time. Smaller turbos spool up quicker, which eliminates some of this lag. Turbochargers thus utilize a wastegate, which allows the use of a smaller turbocharger to reduce lag while preventing it from spinning too quickly at high engine speeds. The wastegate is a valve that allows the exhaust to bypass the turbine blades. The wastegate senses boost pressure, and if it gets too high, it could be an indicator that the turbine is spinning too quickly, so the wastegate bypasses some of the exhaust around the turbine blades, allowing the blades to slow down..
A Supercharger, on the other hand, is connected directly to the crank, so there is no "lag". Superchargers are able to produce boost at a very low rpm, especially screw-type and roots type blowers. This is the turbo's biggest advantage. The turbocharger is generally more economical to operate as it as it is driven primarily by potential energy in the exhaust gasses that would otherwise be lost out the exhaust, whereas a supercharger draws power from the crank, which can be used to turn the wheels. The turbocharger's impeller is also powered only under boost conditions, so there is less parasitic drag while the impeller is not spinning. The turbocharger, however, is not free of inefficiency as it does create additional exhaust backpressure and exhaust flow interruption. Because the turbocharger is mounted to the exhaust manifold (which is very hot), turbocharger boost is subject to additional heating via the turbo's hot casing. Because hot air expands (the opposite goal of a turbo or supercharger), an intercooler becomes necessary on almost all turbocharged applications to cool the air charge before it is released into the engine. This increases the complexity of the installation. A centrifugal supercharger on the other hand creates a cooler air discharge, so an intercooler is often not necessary at boost levels below 10psi. That said, some superchargers (especially roots-type superchargers) create hotter discharge temperatures, which also make an intecooler necessary even on fairly low-boost applications. Because a turbocharger first spools up before the boost is delivered to the engine, there is a surge of power that is delivered immediately when the wastegate opens (around 3000 rpm). This surge can be damaging to the engine and drivetrain, and can make the vehicle difficult to drive or lose traction. Because the supercharger eliminates the need to deal with the exhaust gas interruption created by inserting a turbocharger turbine into the exhaust flow, the supercharger creates no additional exhaust backpressure. The amount of power that is lost by a turbo's turbine reduces it's overall efficiency. In general, superchargers enjoy a substantial reliability advantage over the turbocharger. When a a turbo is shut off (i.e. when the engine is turned off), residual oil inside the turbo's bearings can be baked by stored engine heat. This, combined with the turbo's extremely high rpms (up to 150,000rpm) can cause problems with the turbo's internal bearings and can shorten the life of the turbocharger. In addition, many turbos require aftermarket exhaust manifolds, which are often far less reliable than stock manifolds. Superchargers are substantially easier to install than a turbos because they have far fewer components and simpler devices. Turbos are complex and require manifold and exhaust modifications, intercoolers, extra oil lines, etc. - most of which is not needed with most superchargers. A novice home mechanic can easily install most supercharger systems, while a turbo installation should be left to a turbo expert. Turbos are known for their unique ability to spin to incredibly high rpms and make outrages peak boost figures (25psi ). While operating a turbocharger at very high levels of boost requires major modifications to the rest of the engine, the turbo is capable of producing more peak power than superchargers. Turbochargers, because they are so complex and rely on exhaust pressure, are notoriously difficult to tune. Superchargers, on the other hand, require few fuel and ignition upgrades and normally require little or no engine tuning. While the supercharger is generally considered to be a better method of forced induction for most street and race vehicles, the turbo will always have its place in a more specialized market. Superchargers generally provide a much broader powerband that most drivers are looking for with no "turbo lag". In addition, they are much easier to install and tune, making them more practical for a home or novice mechanic. We hope you have found this discussion informative and unbiased. Sometimes when we explain this to our customers, they say that we are biased towards superchargers because that is all we carry. 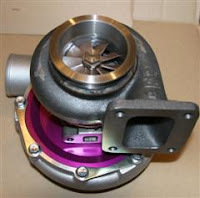 We remind those customers that a turbo is a kind of supercharger and that we truly hope to carry turbochargers someday. The reason we do not currently sell any turbochargers is because we have not yet found a turbo system that is suitable for mail-order / e-commerce sale. We are not prepared to sell a turbo system that is difficult to install and requires the attention of a professional engine tuner or mechanic. If any turbocharger manufacturer makes such a system, please send us the details as we would love to carry such a product. A blower is an air compressor used to force air into the combustion chamber(s) of an internal combustion engine at pressures higher than would otherwise be the case. In cars, the device is used to increase the "effective displacement" and volumetric efficiency of an engine, and is often referred to as a blower. By pushing the air into the cylinders, it is as if the engine had larger valves and cylinders, resulting in a "larger" engine that weighs less. The power to weight ratio of the exhaust gas turbocharged engine is much better than that of the normal engine.